There was no school Monday because of the holiday. We ate corn dogs for lunch at the fair. Grease-tastic! 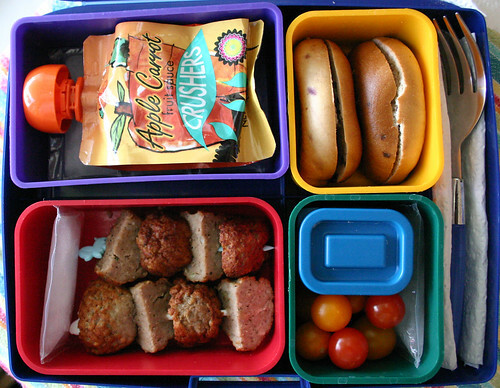 Lunch on Tuesday was: an apple-carrot crusher, a blueberry mini bagel (cut in half so it would fit in the box), turkey meatballs on skewers and a hand full of tomatoes from our garden. The blue box has catsup in it. I used the Laptop Lunch Box which presents a bit of a challenge because it doesn’t fit in Wyatt’s insulated lunch box and I had no way to send an ice pack along. In the past, I’ve solved this problem by putting a frozen juice box in one of the big boxes, but I didn’t have any today, so I had to come up with another way to keep the lunch cold. I remembered seeing a tutorial on Lunch in a Box a few years ago where Biggie cut up an ice blanket and used the individual sections as tiny ice packs for small spaces. By some weird twist of fate, I had an ice blanket in my freezer, so I took a pair of scissors to it and tucked the little pieces into the various containers in the box. You can see some under the applesauce crusher and to the left of the meatballs. This was an awesome trick and I’ll be using it again in the future, for sure. This was a pretty good day. He didn’t eat the bagel and he only ate a couple of the tomatoes, but otherwise almost everything else was gone. 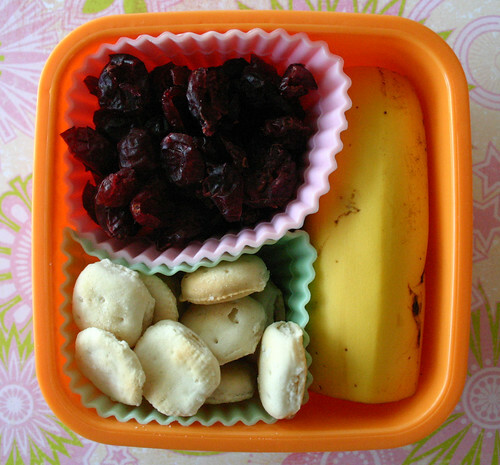 And this was the snack: dried cranberries, oyster crackers and half a banana. Every bit of his snack was eaten. Lunch was raspberries, baked tofu, frozen peas and a half a mini baguette. 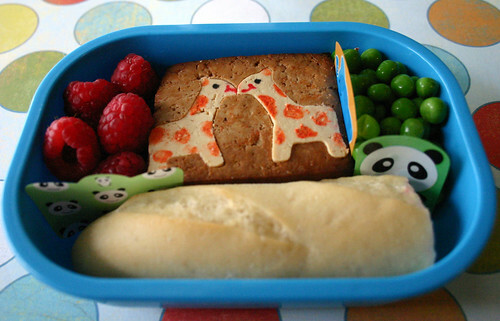 I got about as fancy as I ever do with the tofu, cutting the giraffes out with a cookie cutter and even going to far as to color them with food markers . It was time-consuming, but kind of a fun little diversion while the kids were eating breakfast. 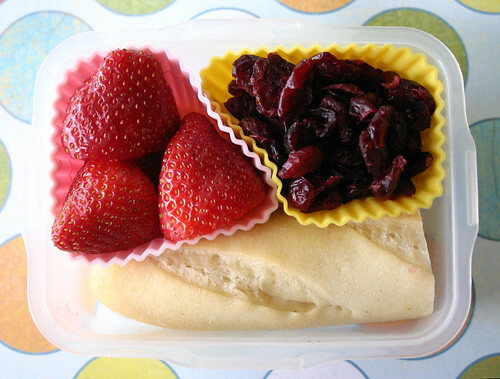 Snack was strawberries, dried cranberries and the other half of the baguette. I packed it in a small locking style box that I think I either got at Target or the Container Store (sorry, I can’t remember exactly where). 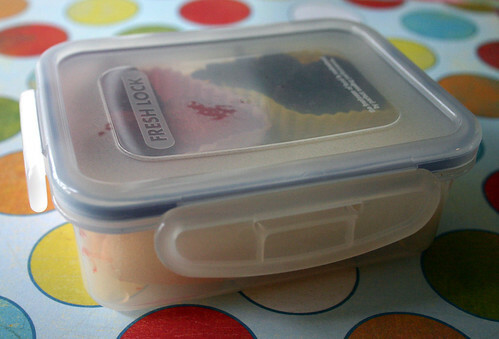 I wanted to show this because this is a perfect example of a non-“bento” box that works perfectly for packing bento-style lunches. Since Ichiban Kan closed their online store, I’ve been getting an uptick in emails asking me where to get bento supplies. You can get some really cute stuff on eBay, J-Box (disclaimer — I’m an affiliate), and other online stores but I find items online can cost quite a lot of money. I really encourage people to look around in their local stores and see what they can find that can work for them. Wyatt’s primary lunch item on Thursday was spaghetti with butter, garlic and parmesan cheese packed into a Thermos. I sent an apple-carrot crusher to go with it, and I remembered to pack a fork for the spaghetti for the first time in months. (I forget almost every time I give him pasta. Bad mom!). The snack box had strawberries, pita crackers and deli ham roll-ups on skewers. I wanted to show a picture of Wyatt’s new lunch bag while I was at it. He had been using a boring, striped thermal bag, but with the start of the new school year, I let him upgrade to a new lunch bag of his choice. He chose this cool Spiderman one. Much more in line with the kindergarten vogue. It works really well for me too. 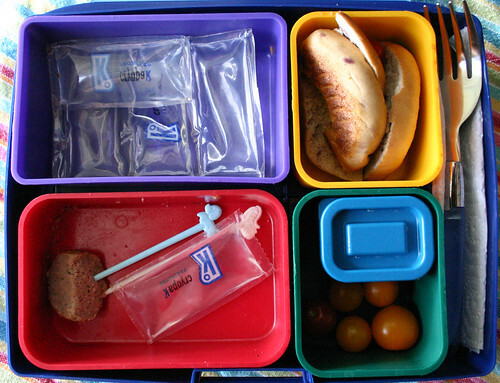 Both the main and bottom compartments fit the bento boxes we use perfectly and I don’t have to turn anything on it’s side to get it into his lunch box like I used to with the old one. 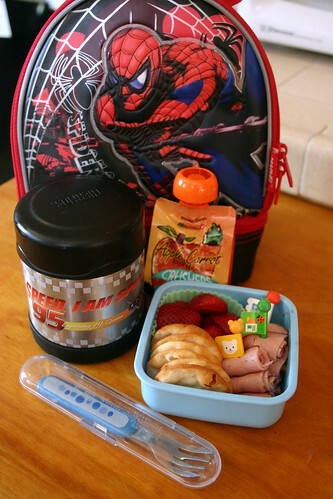 Technically, this was Wyatt’s snack, but he refused to eat any lunch today, so I packed him a lunch-sized bento instead. 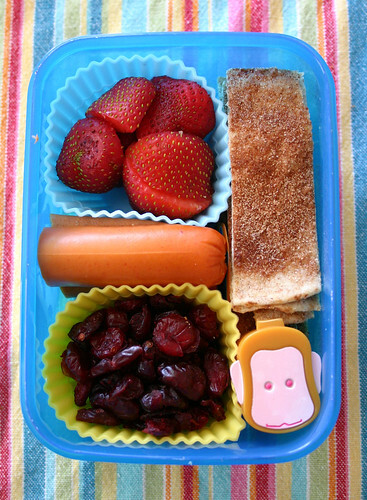 It had strawberries, a turkey hot dog (with catsup in the monkey box), dried cranberries and cinnamon-sugar whole-wheat tortilla strips. I used to make these tortilla strips for myself all the time when I was a kid, but I’d completely forgotten about them until I saw that Nikki over at Whimsy Love had put some in her daughter’s first bento box. To make them, I just spread a whole-wheat (or regular flour) tortilla with a little butter, sprinkled it all over with cinnamon sugar, baked it in the toaster oven for a few minutes and cut it into strips. 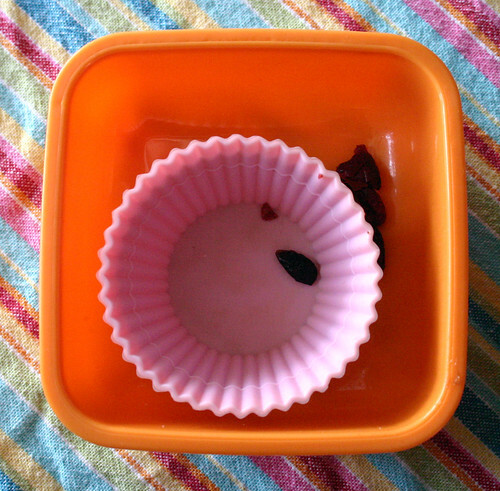 Easy peasy and super yum!